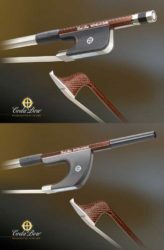 Standard model Glasser fiberglass bass bows feature a half-lined bow frog with a metal under-slide and an imitation three-part button. They have genuine unbleached white horsehair and a leatherette grip. Glasser fiberglass bows offer students a good alternative to inexpensive wood bows, since they are more durable and will not warp. 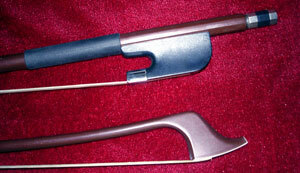 These bass bows are available in both French and German models.